The area around Les Glòries – once a hated roundabout and now the eastern entrance to the city – is currently referred to as Barcelona’s largest building site. Measuring 15 hectares, this ambitious project will one day see expansive green zones, playgrounds and other civic amenities. It’s an ambitious project that sees the completion of Ildefonso Cerdá’s unique grid layout, and reinforces Barcelona’s reputation for excellence in urbanism. Els Encants flea market is one of Europe’s oldest. Since the middle ages, a community of traders have been hawking the remains of deceased estates, old stocks of ribbons and fabric, electronic parts and you-name-it on pretty much the same spot. As part of the overhaul of Les Glòries, which includes moving traffic to underground tunnels, they had to be moved. Instead of banishing them to a plot on the outskirts, which would have been the case in city’s with less sympathy to the benefits of good urbanism, the city’s authorities decided to commission a permanent home for them. B720 is headed by Fermin Vázquez and Ana Bassat. The firm they founded has partnered with international architects on some of Barcelona’s most daring buildings, such as David Chipperfield’s City of Justice and Toyo Ito’s Torres Porta Fira. However its Els Encants market that remains the studio’s signature project. The concept of a large plaza, almost an extension of what will be the Glòries site once completed, was behind the program. The idea was to protect the sellers and their wares from dust and rain and give order to the large number of stalls, but not enclose them. 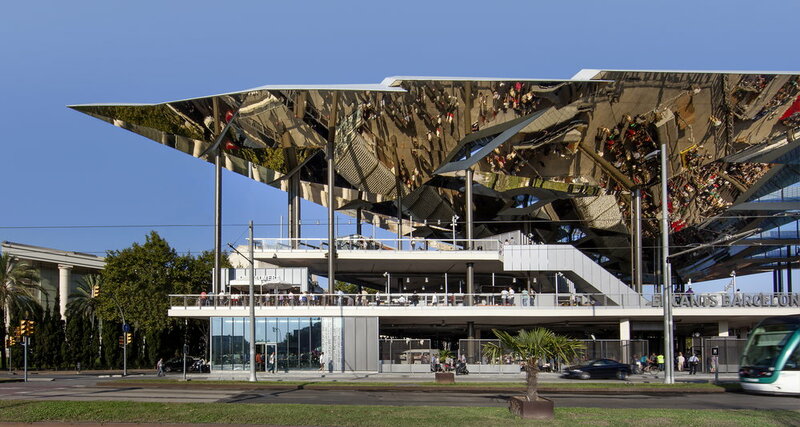 The architects did this by constructing a cluster of soaring metal canopies, which act as a watery mirror for both the frenetic activity of the market and, from the upper levels, the area that surrounds them. Underneath, a series of spiral ramps lead shoppers around the stalls: permanent ones are housed in simple locales with roller doors, and others, whose goods vary from week-to-week trade, as they have done for centuries, off trestle tables. On the lower ground floor is the heat of Els Encants – the rag and bone men (and women) who bid for goods (mostly deceased estates and over stocks) in the early hours at Els Encants’s famous subastas (auctions), which takes place behind closed doors in special facilities underground. This is where vintage, retro and antique fans hunt for treasures, from the mountains objects – from old posters to glass chandeliers – which are laid out on the floor.